iPod and Audio Input Interface Gateway Kit. Directly connects your iPod to your radio allowing you to browse your music, by Artist, Album, Genre, and Playlist from the radio controls. Eliminates the need for noisy FM modulated solutions. Keeps the iPod's internal battery charged. 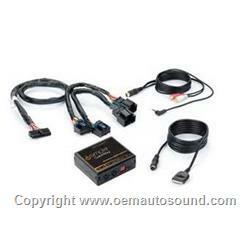 HD Radio, Satellite Radio, and Bluetooth options for select 29-bit LAN general motors vehicles. Allows connection of any two devices at once. Plug-and-play interface eliminates the need to replace the factory radio. Advanced capabilities retain and all safety and convenience features tied to the factory system. Vehicle MUST be either equipped with, or have the ability to support Satellite Radio. Radio must be equipped with a "CAT" or "XM" button to be compatible.